Atlantic Tire’s Anthony and Beth Blackman have given their time — and hearts — to projects in and around Cary, N.C.
CARY, N.C. (Nov. 7, 2016) — Anthony Blackman has a real problem with litter. It’s not uncommon for anyone who’s spent time with the owner of Cary-based Atlantic Tire & Service to witness him break stride — or even pump the brakes on his car in the middle of a parking lot — in order to retrieve a piece of trash that catches his eye. If you ask Mr. Blackman, he’ll attribute this habit to Herb Sendek, who in 1996 became the head basketball coach for North Carolina State University (NCSU), Mr. Blackman’s alma mater. During an NCSU Student Aid Association meeting, Mr. Sendek impressed on attendees that individuals can make an enormous difference by focusing on the little things. It’s hard to find an aspect of life in Cary — be it community outreach, support of the arts or assisting with local business development — in which Mr. Blackman and his wife Beth aren’t involved, as John Collins, branch executive director for the Cary YMCA, will attest. Tire Business photo by William SchertzBeth and Anthony Blackman meet with Diane Hillsgrove, executive director of the YMCA’s Camp Seafarer in Arapahoe, N.C.
Beth and Anthony Blackman meet with Diane Hillsgrove, executive director of the YMCA’s Camp Seafarer in Arapahoe, N.C.
“Through the Y, both of them have been around forever, and then as you start doing other things in the community you find, ‘Oh, they’re there as well,’” he said. “As a company and as individuals, they’re supportive of just the entire community…. 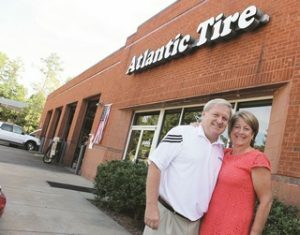 For their dedication to Cary — a city of 150,000-plus in central North Carolina — and the surrounding communities, the Blackmans have been named recipients of the 2016 Tire Business Tire Dealer Humanitarian Award, presented annually to a tire dealer or retreader in recognition of strong commitment to philanthropic efforts. The award was presented to the Blackmans Oct. 31 at the Tire Industry Association Awards Ceremony, taking place during Automotive Aftermarket Industry Week in Las Vegas. This is the 23rd year that Tire Business has presented the award, winners of which are judged and selected independently by the volunteer services committee of the United Way of Summit County, Ohio. 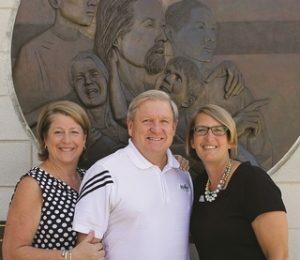 Over the years, the Blackmans have remained broadly committed to improving the Cary community in multiple ways, working with upwards of 40 charitable organizations — such as the Cary YMCA, the Miracle League of the Triangle and the Boy Scouts of America’s Occoneechee Council — as well as involvement in bringing new business to the area through the Cary Chamber of Commerce. Tire Business photo by William SchertzLesle Covington is executive director of the Carying Place, a non-profit dedicated to working with homeless families to help them escape poverty and achieve independence through mentoring, that is aided by donations from Atlantic Tire Owner Anthony Blackman. Lesle Covington is executive director of the Carying Place, a non-profit dedicated to working with homeless families to help them escape poverty and achieve independence through mentoring, that is aided by donations from Atlantic Tire Owner Anthony Blackman. In recognition of the award, Tire Business presented the Blackmans with a check for $2,500 to be donated to the charity of their choice. The Blackmans selected as the recipient Cary-based Life Experiences Inc., a nonprofit that blends education, training and the free enterprise system. From the moment you meet the Blackmans, their love for the community and the people in it becomes apparent, and it’s a quality that’s not lost on the various organizations to which they’ve donated their time and upwards of $2.7 million during the couple’s tire industry career. According to Mr. Blackman, his love of giving back stems in large part from values instilled in him by his parents. Mrs. Blackman, who helps out in the dealership’s office, also said her upbringing ingrained in her a strong desire to help other people. “My parents are still alive, and they’re very much into the church and helping people,” Mrs. Blackman said. “My dad can’t just walk by somebody needing something. Many opportunities to support various charitable organizations have come about through the Blackmans’ involvement in the Rotary Club of Cary. Tire Business photo by William SchertzAnthony Blackman (left) has had a can-do attitude when helping the Boy Scouts of America with projects over a decade. He’s shown with Tyler Perkinson, director of the BSA’s Crosswinds district, and Roger Skirvin, field director for the council. Anthony Blackman (left) has had a can-do attitude when helping the Boy Scouts of America with projects over a decade. He’s shown with Tyler Perkinson, director of the BSA’s Crosswinds district, and Roger Skirvin, field director for the council. Mr. Blackman also has found ways to give back to the community through his own three-outlet tire and service business as well, with promotions such as the “Repair My Ride” contest it launched two years ago. In the inaugural contest, Mr. Blackman couldn’t choose between two entries and elected to award both of them $1,000 in free vehicle repairs. Atlantic Tire has also given away Thanksgiving hams to clients, employees and mail carriers, among others. The Blackmans have also helped out a number of Atlantic Tire employees over the years, including Tim Bowman, a tire technician whom they’re helping pay for college tuition. Mr. Bowman is working toward a business degree at North Carolina Wesleyan College, which he hopes to use to manage his own store eventually. For Mr. Blackman, helping others has always brought him more joy than wealth. Many of the Blackmans’ contributions over the years have gone towards supporting organizations designed to meet the needs of area families. Chief among these is the Cary YMCA, one of their top donations recipients. Diane Hillsgrove, executive director, Camp Seafarer, YMCA and a member of the Rotary Club of Cary, formerly served as branch directory for the Cary YMCA and has worked with the Blackmans for many years. “It takes all these non-profits and all these organization to make a community strong, and I think the Blackmans have realized that they can really impact and strengthen the support system of the community in a way that makes these non-profits able to support the community better,” she said. Ms. Hillsgrove’s relationship with Mr. Blackman began in the 1990s as a customer at his shop. The first time she met him, he “greeted me like he’d known me forever,” she said. Eventually that relationship turned into both a commercial account for Atlantic Tire with the YMCA and a long-term commitment from the Blackmans to support the organization’s various youth and family programs. Mr. Blackman has always been willing to help “in any way that we’ve ever needed anything,” Ms. Hillsgrove said — from raffle ticket purchases to offering a free car care clinic for members of the YMCA staff to funding the building of a new YMCA building in Apex, N.C. The couple also regularly has made contributions to the YMCA’s annual fundraising campaign, which supports programming for families and children who might not otherwise be able to afford the programs they offer. 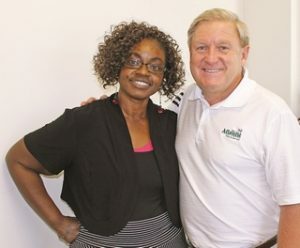 Ms. Hillsgrove emphasized that while Mr. Blackman and Atlantic Tire are often credited with supporting various charitable causes, Mrs. Blackman has always played an active role in supporting her husband and the community. “Anthony’s story is Anthony’s story to tell, but Anthony just has a passion for people who need a little extra support to get to a place that they can stand on their own and that they can have opportunities,” she said. That passion can be seen for the Blackmans’ support of The Carying Place (TCP), a non-profit 501(c) (3) organization that works with homeless families to help them escape poverty and achieve independence through mentoring, teaching life skills such as money management and providing them with housing over the course of a 16-week program. “What we really deal with is the working poor — people who all it takes is for them to miss one paycheck or a couple paychecks and they find themselves in dire circumstances,” Leslie Covington, executive director for TCP, told Tire Business. To date, the organization has assisted more than 360 families and has achieved a 90-percent success rate. But running such a program doesn’t come cheap, which is where the Blackmans come in. Over the course of a year, TCP will assist 26 families by providing transitional housing in one of nine housing units it uses. Donations go to cover utilities and other housing costs, as the families enrolled in the program put their income in escrow accounts they eventually will use for security deposits and rent when they move on. The Blackmans have supported TCP for the last nine years annually through a gold level sponsorship of its annual Labor Day “Race for Home,” an event that in 2016 attracted well over 500 registrants, including participants from other states. Mr. Blackman cited TCP as perhaps his favorite non-profit group, and said it has always been easy to support. Atlantic Tire traditionally has donated tires to the group’s “A Place to Call Home” annual silent and live auction — which Mrs. Blackman has even taken responsibility for organizing in the past—and occasionally provided free automotive services to families enrolled in the program. In addition, Mr. Blackman previously served on the group’s board of directors and Mrs. Blackman on the advisory board. But the Blackmans also give something to TCP that’s difficult to measure: credibility. “Being a part of Cary’s ‘Who’s Who,’ their presence gives us merit,” Ms. Covington said. “Because they support us, a lot of people will say, ‘You know what, that’s got to be some good stuff going on over there.’ And that’s what happens is when their light is shining it shines in someone else’s direction, and it actually gives us more attention and it allows us not just to raise money but to raise awareness of what we do. “We are reducing homelessness in this area, in a place where affordable housing is almost next to impossible,” she added. “They are making sure that families are getting housed and getting the skills they actually need so that they can actually do it for themselves. 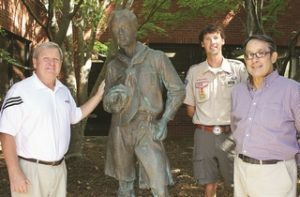 The Blackmans also have supported the Boy Scouts of America’s Occoneechee Council, primarily through its Crosswinds District—part of the former larger Dan Beard District. It’s a relationship that stretches back over a decade. “Every non-profit needs folks with influence, folks with time and folks that care about the program,” said Tyler Perkinson, district director, Crosswinds BSA, Occoneechee Council. Mr. Perkinson said that the Blackmans have assisted the council both through financial donations and in a variety of other ways, over the years becoming one of the council’s greatest contributors. The Blackmans’ long relationship with the Boy Scouts organization began when Roger Skirvin, field director for the council and another member of Mr. Blackman’s Rotary Club, asked him to assist in sponsoring and promoting a breakfast fundraiser. This breakfast became an annual even for the Dan Beard District, drawing hundreds of members of the community each year. In 2011, about the time when the Dan Beard District was split into two districts, the breakfast evolved into the Crosswinds Distinguished Citizens Award Dinner, which the Blackmans have also helped to organize, promote and sponsor since its inception. In addition, Mrs. Blackman co-chaired the dinner for the first two years. They also have sponsored the council’s annual Eagle Scout dinner for the past four years, and in 2015 Mr. Blackman joined the Occoneechee Council’s board of directors. Mr. Skirvin said he admires the Blackmans’ willingness to support community programs like Boy Scouts, not just through donation but through the time and energy they put in. Another group the Blackmans have supported over the years is Loaves and Fishes Ministry Inc., a non-profit group geared toward empowering low-income children and their families to overcome challenges by providing long-term extracurricular programming. The group collaborates with schools and other community organizations to identify children in need and provide support. Loaves and Fishes serves upwards of 40 kindergarten through 12th grade students in a comprehensive after-school program located at Milner Memorial Presbyterian Church in Southeast Raleigh. “These are all kids who live in poverty,” said Joe Burmester, executive director for Loaves and Fishes. “All of their families struggle with stable housing, food, transportation and living wage jobs. For Mr. Blackman, the organization brings back memories of where he began his tire industry career and a young boy named Tommy who lived behind the Goodyear dealership in Raleigh, N.C. During Mr. Blackman’s time there Tommy became like a family member. Tommy never lived to see his 17th birthday — he died of a social disease, Mr. Blackman said — but working with Loaves and Fishes gives the Blackmans an opportunity to help prevent that from happening to other kids dealing with similar problems. Loaves and Fishes owns two small buses it uses to transport students. Atlantic Tire repairs the vehicles for free. “One of the things that Anthony has done is, every year they give us a substantial credit that we can work off of in terms of maintenance, supplies or tires, or whatever we have to do, which is great because that’s the kind of stuff where you never know if something’s going to break down,” Mr. Burmester said. Much of the Blackmans’ financial support over the years has gone towards assisting those with special needs. One benefactor is Life Experiences, a non-profit that offers a choice of work experiences for adults with physical and mental disabilities, and at the same time allows those adults the self-esteem of earning a wage for their work. Life Experiences operates five small businesses — a bakery service, shredding service, buckwheat hulls, commercial laundry and a sub-contracting division specializing in packaging and collating. They offer employment to those with developmental disabilities while also providing valuable services and products to the community. Mary Madenspacher, executive director of Life Experiences, said the organization employs 50 adults with special needs in a variety of roles and that supporters like Mr. Blackman help to ensure they have jobs. Ms. Madenspacher said the Blackmans have been regular supporters of the organization’s silent and live auctions and sponsors of its annual golf tournament. This year, those events brought in approximately $115,000. In addition, Atlantic Tire has assisted in their automotive maintenance needs on several occasions. “With all of the stuff coming and going out of here, particularly the laundry, we have a delivery service,” she said. “So we have a big old (Ford) F350 back there with a trailer behind it, and when it has a flat tire it’s a major ordeal for us to take care of, and we can’t get that tire off. We’re not jacking that truck up. The Blackmans also have regularly supported Miracle League of the Triangle, an organization dedicated to providing an opportunity for children with physical and mental disabilities to play in a baseball league. The local Miracle League is celebrating its 10th anniversary in 2016, having held its first game in September 2006, during a time when the league consisted of eight teams and 120 players. Today it stands at 32 teams with 500 players across two leagues in Cary and Raleigh. H.E. “Tony” Withers III, another of Mr. Blackman’s fellow Rotarians, led the effort to start the league, but he knew it would be a tall effort to raise the $750,000 needed to build the ballfield. Mr. Blackman, he said, wrote him a check for $10,000 and then convinced his friends to do the same by showing them a video about the league. “The good thing about him is he’s pretty connected in Cary,” said Benjy Capps, executive director, Miracle League of the Triangle. Mr. Withers estimated that the Blackmans’ lifelong donations to the organization — direct and through sponsorships of its annual golf tournament — have exceeded $100,000, money that has gone towards covering office rent, bats, special balls, jerseys, team pictures and various other costs. While the Blackmans are often praised for their commitment to supporting non-profit groups in the Research Triangle, often overlooked is Mr. Blackman’s commitment to economic development in the area. “The longevity and the commitment to really building into certain organizations that (the Blackmans) know is touching a lot of people, but what I love is that they support the chamber of commerce,” Ms. Hillsgrove said. “Some people would say, ‘Well the chamber of commerce is business,’ but that’s people’s livelihoods, and people’s livelihoods are their families. Howard Johnson, president of the Cary Chamber of Commerce, said Mr. Blackman has been involved with the chamber since Atlantic Tire came into the area. He is serving his third term on the chamber’s board of directors and has been a member of the executive team for years as well. “Anthony’s company is involved in every aspect of our major events,” he said. “Our annual banquet, annual business expo — they’re the major sponsors — Business After Hours, Eye Opener (Breakfast). Every fiber of the business side, he’s there. At the state level, Mr. Johnson said, Mr. Blackman works with the department of commerce to help bring new business to the state. “Anthony plays an integral part in dealing with our North Carolina Department of Commerce in talking to companies, and he sits on a committee that helps in a lot of the incentive side for our state, which plays a major role when a company is looking at North Carolina compared to our sister states,” he said. His commitment to Cary’s economic development even pushed him to take on a three-year, $55,000-per-year sponsorship of the Association of Tennis Professionals’ Challenger Tour in Cary, called the Atlantic Tire Championships. “The town came to me last year and said if you don’t help us, we can’t have this tennis tournament, knowing that I’ve been involved with tennis and I’ve been trying to promote tennis here and all,” he said. The three-year contract term, he said, is designed to give the community enough time to find a “big-time” company with a larger marketing budget to continue the sponsorship going forward. “It’s great exposure, it’s for the community and sometimes you do things not knowing if it’s gonna do anything for you, and that’s OK,” Mr. Blackman said. “…Ten years from now if Metlife is doing it and they’re getting all the exposure, they’re on TV and stuff like that, will they remember me?